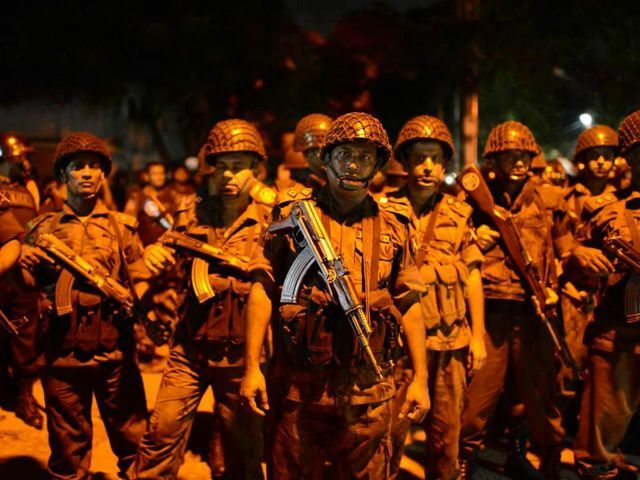 DHAKA, Bangladesh (AP) — Heavy gunfire and explosions rang out Saturday morning as Bangladesh security forces backed by armored vehicles moved to end a 10-hour standoff with heavily armed militants holding dozens of people hostage, including foreigners, after storming an upscale restaurant at the heart of Bangladesh's diplomatic zone. Two police officers were killed and at least 26 people wounded in an earlier gunbattle. The Islamic State group claimed responsibility for the attack on the Holey Artisan Bakery in Dhaka's Gulshan area, according to the SITE Intelligence Group, which monitors jihadis activity online. At least 35 people, including about 20 foreigners, were trapped inside the restaurant, said kitchen staffer Sumon Reza, who was among more than 10 people who managed to run to the rooftop and escape when the militants moved in Friday night. Local TV stations reported that the rescue operation began at 7:40 a.m. It included army personnel with automatic weapons and at least seven armored vehicles. Several ambulances were on standby. Local media reported that an Argentine and two Bangladeshis were rescued from the restaurant early Saturday, but details about their condition were not immediately available. Journalists were not allowed near the scene. Bangladesh did not immediately respond to the claim of responsibility by IS, but in the past have denied that the extremist group has a presence in the country. The U.S. State Department said it had seen the IS claim, but could not confirm its authenticity. A news agency affiliated with the Islamic Group claimed that 24 people had been killed and 40 wounded, including foreigners, according to SITE. The figures could not be independently confirmed. The Amaq news agency also posted photos purportedly showing the bodies of hostages. The authenticity of the pictures could not be confirmed either. The attackers "have not responded to authorities' calls for negotiation," said a member of the elite anti-crime force, Rapid Action Battalion, identifying himself as Lt. Col. Masood, during an interview with the Indian TV channel Times Now. He said that the security cordon would prevent any of the attackers from escaping. Authorities also ordered internet services to be blocked across the country, according to internet service provider Aamra. Police said the two officers died at a hospital after being wounded in the gunfire with as many as nine attackers, who also hurled bombs. Ten of the 26 wounded were listed in critical condition, six of whom were on life support, according to hospital staff, who said the injuries ranged from broken bones to gunshot wounds. Only one civilian was among the wounded. Reza said the attackers chanted "Allahu Akbar" (God is Great) as they launched the attack around 9:20 p.m. Friday, initially opening fire with blanks. A huge contingent of security forces cordoned off the area around the bakery. The head of the Rapid Action Battalion told reporters Friday night that they were working to save the lives of the people trapped inside the restaurant. The hostages included an unknown number of foreigners. Their nationalities were not immediately clear. On Saturday, Japan's top government spokesman Yoshihide Suga said at a hastily called news conference in Tokyo that the government is trying to confirm that Japanese were among the hostages. Prime Minister Shinzo Abe told reporters that saving lives is the top priority. "Some derailed youths have entered the restaurant and launched the attack," Benazir Ahmed said. "We have talked to some of the people who fled the restaurant after the attack. We want to resolve this peacefully. We are trying to talk to the attackers, we want to listen to them about what they want." "Our first priority is to save the lives of the people trapped inside," Ahmed said. He would not say how many people were being held hostage. "My nephew Hasnat Karim called me and said he was inside with his family. He told me, 'Please save us, please!' And he hung up," he said. "We do not know what is going on there." The spree of recent attacks in Bangladesh have raised fears that religious extremists are gaining a foothold in the country, despite its traditions of secularism and tolerance. Prime Minister Sheikh Hasina's government has cracked down on domestic radical Islamists. It has accused local terrorists and opposition political parties — especially the main opposition Bangladesh Nationalist Party and its Islamist ally Jamaat-e-Islami — of orchestrating the violence in order to destabilize the nation, which both parties deny.